A green, healthy lawn and perfectly trimmed shrubs and trees are a major statement to any house. Along with remembering to add a creative display throughout the holidays and the different seasons. We all want to have the best looking home in the neighborhood, so it’s time to start a new, new year’s resolution. No more letting your front lawn overgrow or saying, “I will get to adding that vegetable garden next year.” This year, follow some of these routines to help make your house stand out the most on the block. 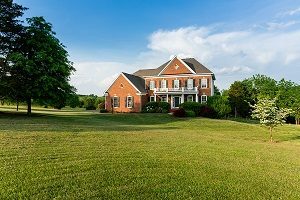 If you noticed throughout 2018 that your lawn was burning out easily or not growing right, then it is time to understand how to feed your lawn correctly. Your lawn needs at least an inch of water per week, make sure you are paying attention to if it is raining a lot or not. You could install a sprinkler system or purchase a sprinkler attachment for your hose. A lot of people believe that mowing your lawn is only cosmetic, but it actually helps keep it healthy and promotes its growth. The beginning of the summer season is when your grass grows the fastest. Make sure you are mowing it at least once or twice a week. If you cannot commit yourself to maintain a mowing schedule, consider hiring a lawn mowing service to do it for you. This may seem obvious to some, but to others, you may not know that pruning your trees is very important. In order for your shrubs and trees to grow preoperatively and to promote healthy, stronger growth, you need to prune your trees. There are several different pruning techniques such as cleaning, thinning, raising, and reduction. Be sure you are pruning correctly: otherwise, in the end, you could ruin your trees and shrubs. Having your own vegetable garden will add to any landscape. Not only will it beautify your yard, but you will have your own home-grown veggies to eat. Make sure you choose somewhere that gets enough sunlight along with creating a protective barrier around the edges. There is nothing worse for your garden than to wake up with nothing growing because rabbits or other animals are eating everything. Do you believe your landscape is just not lit up enough? Consider adding spotlights, lamps, or task lights around walking areas. You can also get creative and add some string lights to your back patio for when you entertain guests. Adding spotlights in the front and back of your home can also act as a security system. Keeps your soil at a consistent temperature for trees and plants to grow and prevents them from drying out. Acts as a weed barrier for your garden to protect your flowers or plants. Protects roots and prevents frost heavy in the winter. Beautifies your landscape by choosing the right mulch, your landscape will be more appealing. This year start it off right by hiring professional lawn caretakers. At Greener Horizon, we will handle your large estate or commercial land from plant care to pruning to mulching. We understand that you take pride in your home’s appearance, allow us to get your landscape ready. In addition to our expert care and services, we also offer a free consultation to help you achieve the landscape of your dreams. Contact us today.